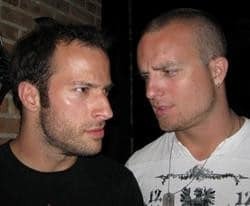 We have taken our acclaimed dueling piano act and created a show that is specifically tailored for the college and university environment. Our interactive musical comedy experience will have your students singing, shouting, dancing and laughing. Your students provide the direction of the show by writing their favorite songs on request slips that they bring up to the pianos. The players take these and create a spontaneous, hilarious and interactive musical odyssey. 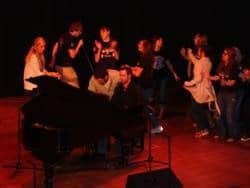 The fact that many of their favorite Rock, Country, R&B and Rap songs can actually be performed on the piano will leave students wide-eyed and amazed. To further the crowd interaction, we may also bring some of the audience up onto the stage to perform a song, dance and/or skit for their fellow classmates that will bring the house down. We have recruited and trained some of the finest young talent around, and all veterans of the dueling piano industry. Although the company is based in Michigan, they have teams of players stationed all over the country to be able to provide this inventive show to colleges and universities across the United States. 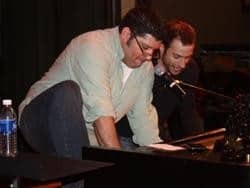 Content is never an issue for the Midwest Dueling Pianos performers. From G-Rated to PG-13, the players can conform to whatever rating the school and local community prefers. We can accommodate any size event, from a concert in a large campus theater, to an intimate get together in the basement of the Student Union. We have also performed at High Schools and other educational related events around the country. If you want to bring this level of excitement, hilarity, musicianship and raw fun to your students, please contact us today. We would be happy to answer any questions that you have. Any requests for pricing will be forwarded to our College and University booking agency. 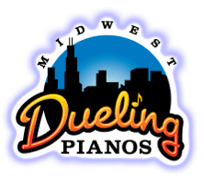 © 2016 Midwest Dueling Pianos, DMG Computer. All Rights Reserved.